but first you'll need to download a free torrent so you can download twilight in the first place. my ones called Bitlord. google it. then go to mininova.com and download twilight. its good quality and doesnt cost anything. i watch it on my comp and ipod all the time. can't get enough. lol. edwardlikeshaystacks wrote: I guess I'm one of the few who didn't seem to catch the mouthed, "I love you". I think its good that they didn't rush into speaking that yet in the movie. Their relationship seemed to have developed a little too fast and hopefully leaving off on the three words takes things a little slow until NM. I didn't catch it either, I've even seen that clip online since I read that he did that, and it's still hard for me to notice. I see his lips move, and really want to see it, but I don't know if he says "I love you"
EDIT ok, I watched it yet again haha, and I guess his lips do move for a second there, and as jazzgirl said, he "barely mouths the words"
If it's true, I have to say, I ADORE that scene even more now. Thanks for posting that!! can you send it to me too?? For those of you who didn't notice the "I love you" <sigh!! !>, I can only guess that maybe my husband was correct in saying I spent wwwwaaaaayyyyyyy too much time during my first dozen or so viewings watching Rob to the exclusion of things like Mike asking Bella to prom, or the friends table during the "what if I'm the bad guy" scene. Thankfully, I was eventually able to pull my attention away to see the bigger picture. 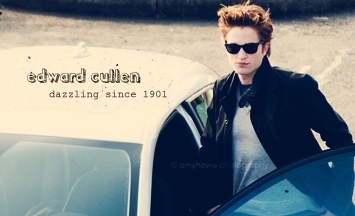 I can only say that Edward really does dazzle, especially when given life by the incomparable Rob Pattinson. Jazz Girl wrote: Thankfully I can only say that Edward really does dazzle, especially when given life by the incomparable Rob Pattinson. Jazz Girl wrote: For those of you who didn't notice the "I love you" <sigh!! !>, I can only guess that maybe my husband was correct in saying I spent wwwwaaaaayyyyyyy too much time during my first dozen or so viewings watching Rob to the exclusion of things like Mike asking Bella to prom, or the friends table during the "what if I'm the bad guy" scene. Thankfully, I was eventually able to pull my attention away to see the bigger picture. I can only say that Edward really does dazzle, especially when given life by the incomparable Rob Pattinson. I'm glad my husband isn't alone with his sentiments! LOL!! Don't get me wrong. My husband loves the books, and the movie too. He's almost as impressed with Rob as I am. But, he'd probably bust a vein if he knew exactly how many times I have seen the film. Maybe your hubby and mine can start their own support group; Twilight Widowers, for men who've lost their wives to beautiful fictional sparkly vampires! ok the movie was friggin' amazing, duh! Am i the only person who thinks the director screwed it up a bit? I mean, the director focused on the action scenes. so the action scenes were the best action scenes ever! but there was no scenes of edward and bella, if you hadn't read the book, you wouldn't really believe they were in love. New Moon will be BETTER! And through all my complaints, it's still one of my favourite movies. thanks, i got your PM!